Not even a day after our story aired on KSBW – leading off the newscast, no less – KION Central Coast News got in on the “Lost Parks” action, with their own report! On a side note – what is it about Boston area-born reporters and the Bay Area? That’s two now! Second side note – we’re filmmakers – someone reported it – so it’s official!!! Lost Parks Featured on KSBW Action News! Chalk another news outlet onto the list that’s discovered the charm and passion of the “Lost Parks of Northern California” series…KSBW Central Coast News led their newscast with a story on our project! December 26, 2013 | Categories: Lost Parks, Television Production | Tags: ACE, ace nor cal, american coaster enthusiasts, amusement park, California, central coast, defunct park, defunct parks, del holland, documentary, great american thrills, history, Huell Howser, kris rowberry, kristopher rowberry, KSBW, lost parks, lost parks of northern california, media coverage, new host, new show concept, nicholas laschkewitsch, Nor Cal, norcal, santa's village, scotts valley, the next huell howser, theme park, travel, urban exploring, walt disney | Comments Off on Lost Parks Featured on KSBW Action News! 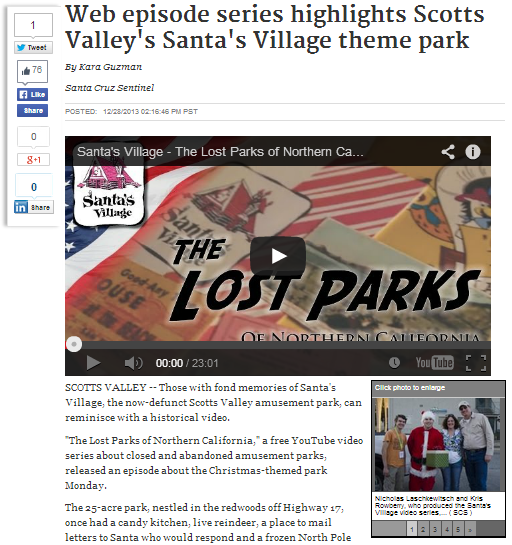 Santa’s Village Lost Parks Episode Now Available! December 23, 2013 | Categories: Amusement Parks, Lost Parks, Television Production, Theme Parks | Tags: amusement park, amusement park review, California, dundee, great american thrills, Huell Howser, kris rowberry, kristopher rowberry, lake arrowhead, lost parks #lostparks lost parks of northern california, new show concept, new show idea, Nor Cal, norcal, santa's village, scotts valley, theme park, theme park review, urban exploring | Comments Off on Santa’s Village Lost Parks Episode Now Available! 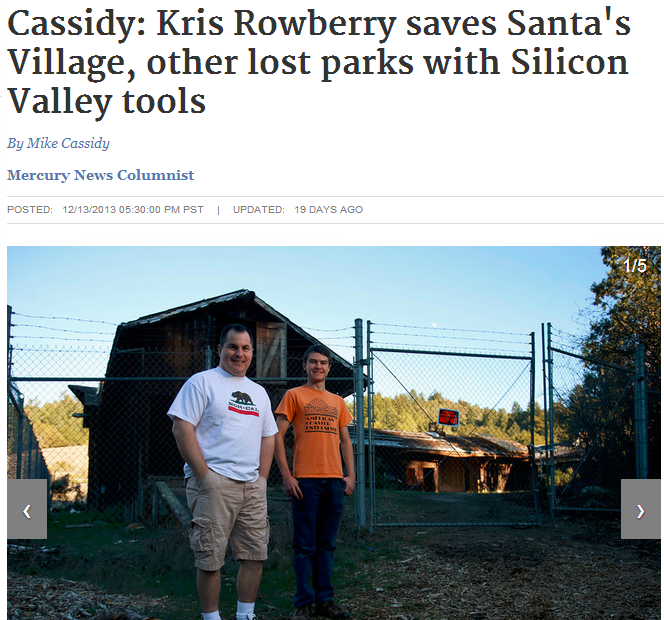 Former Santa’s Village Theme Park Site A Tempting Location for Silicon Valley? It’s been tried before, but will this be the project that finally replaces the empty space left by the Santa’s Village site in Scotts Valley? December 12, 2013 | Categories: Lost Parks | Tags: borland, borland international, development, great american thrills, kris rowberry, kristopher rowberry, lost parks, redevelopment, santa's village, scotts valley, silicon valley, silicon valley business journal | Comments Off on Former Santa’s Village Theme Park Site A Tempting Location for Silicon Valley? Have you been naughty, or nice so far this holiday season? 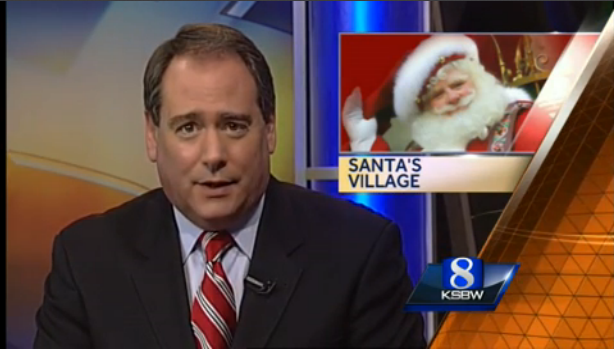 Either way – we’re happy to release a preview to our Santa’s Village episode of the Lost Parks of Northern California! Find out how eating at McDonald’s may connect you to the park – in addition to the many pieces of Santa’s Village strewn throughout Northern California! Stay tuned here to Great American Thrills for the latest updates, including a release date!